PM prepares to return home early to Israel following rocket attacks from Gaza, cancelling address at annual AIPAC conference. 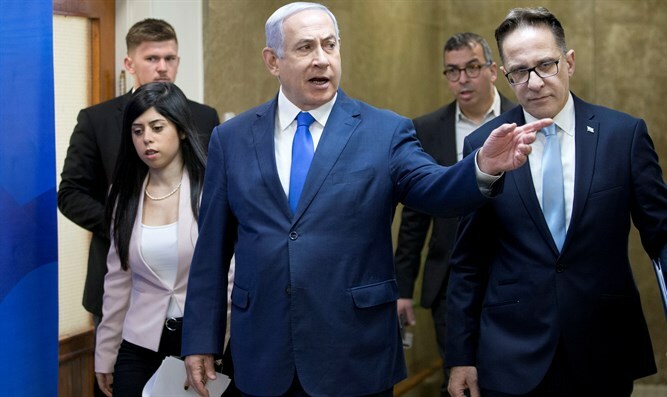 Prime Minister Binyamin Netanyahu has cancelled a planned appearance at this year’s American Israel Public Affairs Committee (AIPAC) conference in Washington DC, following an escalation on the Israel-Gaza border over the weekend. Netanyahu, who had been slated to speak at the AIPAC policy conference on Tuesday, has decided to cut short his Washington visit and return home early on Monday to deal with the security situation, following rocket attacks from Gaza into central Israel. According to a statement by the Prime Minister’s Office Monday morning, Netanyahu will return home Monday, following his meeting with President Donald Trump. “In the wake of the security-related incidents, the Prime Minister has decided to cut short his visit to Washington and to return to Israel following his meeting with President Trump,” the Prime Minister’s Office said. Seven people were injured early Monday morning after rockets were fired from the Hamas-ruled Gaza Strip into central Israel. At least one rocket landed in the Sharon region in central Israel, hitting a home in the Moshav Mishmeret. A 60-year-old woman was wounded by shrapnel and suffering burns from the rocket’s explosion, leaving her in moderate condition. A 30-year-old woman is also said to be in moderate condition after suffering shrapnel wounds. Five others are listed in light condition. The attack marks a major escalation in tensions between Israel and the Hamas-ruled Gaza Strip. While terrorist groups operating in the coastal enclave have fired hundreds of rockets towards Israeli territory, the vast majority have targeted areas adjacent to the Gaza Strip in Israel’s south, and have mostly landed in unpopulated areas. Monday’s attack, however, targeted the Sharon region in central Israel, some 50 miles from the Gaza Strip – a far more densely populated area than the Gaza envelope region.